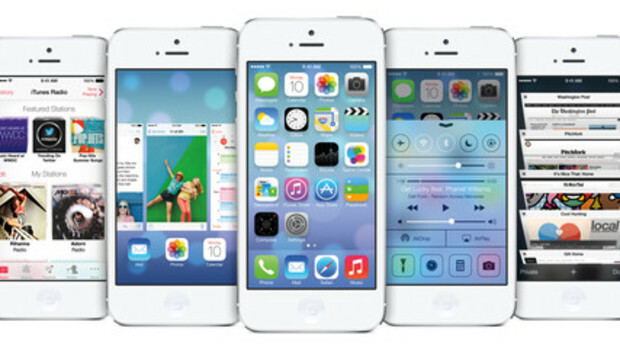 Anyone planning to buy a new smartphone this year can't ignore the slew of updates Apple just made to iOS 7. In total, the revisions seem to be influenced by three overriding principles: (1) Revise an operating system that's long overdue for a major overhaul. (2) Don't change things too much, lest millions of happy iOS users rebel. (3) Keep pace with Android, because the developers in Mountain View haven't been spinning their propeller beanies, doing nothing. Indeed, at last month's I/O conference Google announced a number of updates, a collection of revisions that should help cement Android's position as the dominant smartphone OS, worldwide. So let's take a point-by-point look at how the new iOS updates stack against Apple's main mobile OS challenger. And, remember, we are only looking at new additions in iOS 7. This isn't a complete referendum on the iOS-versus-Android question. Apple is hosting its first WWDC since assigning software design direction to Sir Jony Ive and his team of talent. Ive and company did not disappoint. The new-look iOS 7 is a radical departure from the iOS we've known since 2007--"the biggest change to iOS since the introduction of the iPhone," in the words of Tim Cook. In place of the skeuomorphic design schemes of previous iOS generations, Apple has moved forward with a sleek, translucent, minimalistic approach. And it's breathtaking. The new "Control Center" is a translucent panel that you can swipe up from the bottom of your iDevice's screen to access key functions, like settings (airplane mode, brightness, Bluetooth, etc. ), media controls, and commonly used apps. It can even be used across various apps and the lock screen. This feature is similar to Android's notification panel, which can be swiped to reveal full details on new emails, tweets, sports scores, etc., and is a welcome addition. Winner: iOS. It may be a bit unfair to compare Apple's unified ecosystem to the fractured mess that is Android, but based on Monday's keynote, it looks like iOS offers the far more focused user experience, both aesthetically and in terms of usability. This is what Google gets for letting every manufacturer mess with Android's core UI (often to ill effect). Apple may have been late to the mobile multitasking party, but it's blown right past the competition with iOS' new intelligent take on running multiple apps without draining your battery. Your iPhone will not only adapt its resources to the apps you're currently using, but also note how you use specific apps and allocate computing power accordingly. For example, your phone may take notice of the way you check a weather app when you get up, or how you peruse Feedly during your commute, and make sure those apps are updated with the latest information and properly prepared for use. Compare this to the way that Android keeps apps running in the background, chewing on your RAM, even if the apps haven't been opened for several hours. This blind take on resource allocation is not a friend to battery life. Winner: iOS. Predictive tech will be making its way into more aspects of our digital lives, and Apple is at the forefront. Arguably the biggest debacle of the post-Jobs era, the initial incarnation of Apple's home-grown Maps technology actually incited an apology from the top brass at Cupertino and even a safety warning from Australian authorities. We expected redemption at WWDC 2013, but Apple didn't even announce new mobile maps features today. It did, however, show us stunning 3D maps and search functions for its new desktop system, OS X Mavericks. Apple certainly had a lot to work on, as one of the standout features demoed as I/O was Google's beefed-up Maps technology. During Google's Map unveiling in May, the company seemed to specifically snipe at Cupertino, noting its maps are "sleek, simple, beautiful, and--let's not forget--accurate." It's disappointing--and surprising--that Apple didn't roll out new maps technology in iOS 7, but we can say we love the promise of Apple's new multi-device mapping approach: You can search for directions on your Mac and automatically save the results to your iPhone, where they'll be waiting on your lock screen. This is a very basic function that's sorely missing from Google Maps. Winner: Android. One new killer feature isn't enough. Another product of Ive's minimalist design regime, the new Safari browser goes full-screen and does away with a lot of app-y flotsom, such as an always-present search bar. In doing so, Safari appears to have bitten more than a few visual cues from the mobile version of Chrome. Indeed, Chrome for Android is already a full-screen app that hides the search bar until needed. Safari's new card-based tab view even appears similar in function and design to Chrome's tab/page view. Winner: Android wins. Safari appears to be following Google's lead in the mobile browsing space. Over the past year, Apple has paraded voice-activated personal assistant Siri as the must-have smartphone feature, complete with celebrity-studded endorsements. This go 'round, however, Siri faces serious competition in the voice-operated personal assistant space thanks to Google Now. While Now isn't strictly a personal assistant or a voice UI, its predictive technology helps organize one's digital life across multiple apps and services. In addition to UI updates and a more natural speaking voice--as well as gaining the ability to speak in a man's voice--the updated Siri has been granted far more control over the iPhone's hardware. For example, users can now toggle services like Bluetooth using just their voices, and Siri will dutifully comply. Additionally, Siri can now answer questions more intelligently via new integration with Wikipedia, Twitter, and (both oddly and logically enough) Bing. (Google has been jettisoned from Siri's repertoire.) The kids in Cupertino also unveiled iOS in the Car, a Siri-integrated system that will allow drivers to peruse the virtual world safely and hands-free. Winner: Android. This is neck-and-neck. Certainly iOS grants far more control over your device. However, Now's powerful new predictive tech is at the bleeding edge of the productivity space. If you haven't seen it hand-deliver a baseball score, or tell you your travel times--all without being asked--you haven't fully seen the Now experience. Apple's new music service was just about the worst kept secret in tech. The new feature now known as iTunes Radio presents streaming stations based on personal user choices. The service will be free and ad supported (though it will be ad-free for users using iTunes Match). And, of course, it will all work with Siri. It may be unfair to compare Google All Access and iTunes Radio directly, as Radio has more in common with a service like Pandora, while Google is more likely to run up against cafeteria music services like Spotify. While All Access will create stations for you based on a particular song or artist, it will also allow you to listen to an entire song or album on-demand--a nice function that appears to be missing from iTunes Radio (of course you'll be only a tap away from buying any track for your personal library). Winner: Android--simply because All Access is more versatile. This may change easily as both systems evolve into the future. While Google used its developers' conference to show off some cool new Android functions, the fact that it didn't announce the latest Android version jump leads us to believe that a bigger, generational announcement will be coming soon. In regards to function and aesthetics, Apple has thrown down a mighty salvo, and we'll soon find out if Google has the chops to respond.